*matching 2×12 fullback cabinet with Celestion Creamback and H30 speakers available at special price when ordered together. Dimensions & Weight Head*: 23 5/8″ W, 9 5/8″ H, 9 1/4″ D, 30 lbs. *matching fullback 2×12 cabinet: 24” H, 24” W, 10” D, 53 lbs. 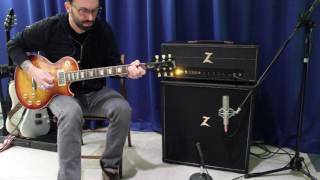 Our goal with the latest Dr. Z amp, the EMS, was to produce the essential sounds of 3 generations of classic British amplifiers. Starting with the mid-60s JTM 50 variant, we combine a dual EL-34 power section with a tube rectified power supply, available by selecting “tube” via the rectifier switch on the back panel. Along with the tube rectifier, setting the EMS’ sensitivity switch to “low” and “Touch” response switch to the down position, this combination will produce the bloom and feel of the early American tweed amps but with the British charm of EL-34 output tubes. Lastly, the EMS incorporates the cascaded gain stage design found in the 80s JCM series. 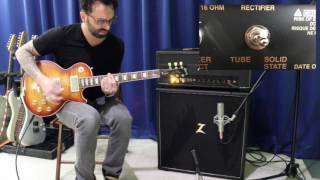 By using the “high” sensitivity switch on the front panel, and selecting solid state rectification, hard rock and classic metal tones with tight bass response and singing gain will come screaming out of your guitar. 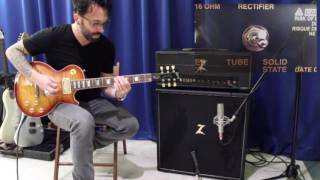 We massaged the circuit to remove some of the annoying, persistent high-treble this era of amplifier has been maligned for and boosted the gain a bit further so that more “modern” drive tones are available higher on the gain knob. 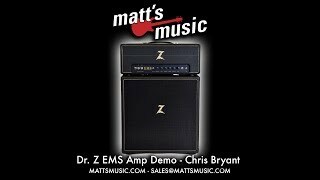 The EMS, like all Dr. Z amplifiers, is 100% hand-wired in Maple Heights, OH using select components throughout its stages and built on a custom rolled aluminum chassis. It has a precise copy of the Drake 784-139 50-watt output transformer for authentic British crunch. For a perfect match to the EMS small box head, we have our 2×12 cabinet loaded with a Celestion Creamback 65M speaker and a Celestion G12 H30 70th Anniversary speaker wired in series for 16 ohm. 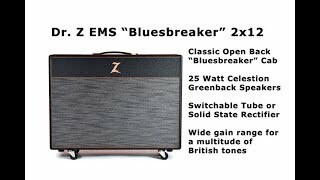 As a combo, the EMS is available in an open-back, 2×12 cabinet with 25 watt Celestion Greenbacks. This cabinet is modeled after the classic JTM 45 “Bluesbreaker” combo and is available in Black, Red, or Navy Blue. 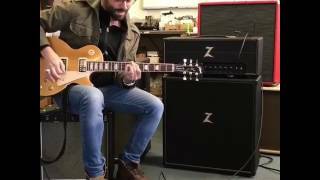 Guitar Player reviews the EMS in the 2×12 “Bluesbreaker” combo configuration.